Those who know Dave Drinkill are most likely of the notion that the Saginaw Spirit general manager is a serious, thoughtful individual who is not known for making rash decisions. Thus, it figures that Drinkill had certainly seen more than enough of what he did not like in making the recent decision to fire second-year head coach Troy Smith and promote Chris Lazary from associate coach to the new bench boss of the Ontario Hockey League team. 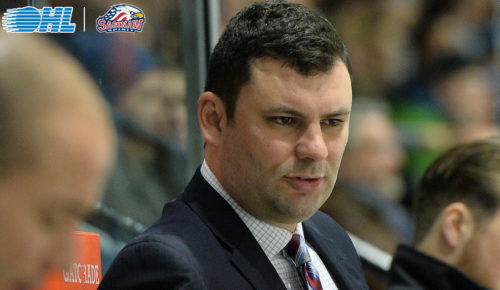 There were high expectations for success in Saginaw this season and while the Spirit has a decent record of 11-9-2 through one-third of the 2018-2019 campaign, the team had dropped three of its past four games — with all of the losses being decisive. Ergo, the no-nonsense Drinkill stepped up as the GM and, citing “philosophical differences” between him and his head coach, made the call to fire the 40-year old Smith, who was in his 13th season in the OHL as either a head, associate, or assistant coach. Smith was an assistant with the Kitchener Rangers for seven years before being fired after two seasons as the head coach of the Blueshirts. He was then an associate coach with the Hamilton Bulldogs before resigning his position part way through his second season. Now, enter the 36-year old Lazary to try to instill more Spirit into a highly-skilled Saginaw squad that others in the OHL, besides its GM, were of the opinion that the team was underachieving with Smith at the helm. Drinkill, a man who does not mince or waste words, summed up his decision to make a coaching change in an even manner. “I felt a change at this time was the best thing for our players and the franchise,” said the 35-year old Drinkill. PHOTO: New Saginaw Spirit bench boss Chris Lazary.